In a significant milestone for the renewable energy sector, Bloomberg New Energy Foundation (BNEF) reports that global wind and solar capacity surpassed 1 terawatt (1,000 gigawatts) as early as June this year. To put that number into context the average Australian used approximately 1,112 watts per year in 2016, meaning our country of 25 million people used just 0.025 terawatts of energy in total. 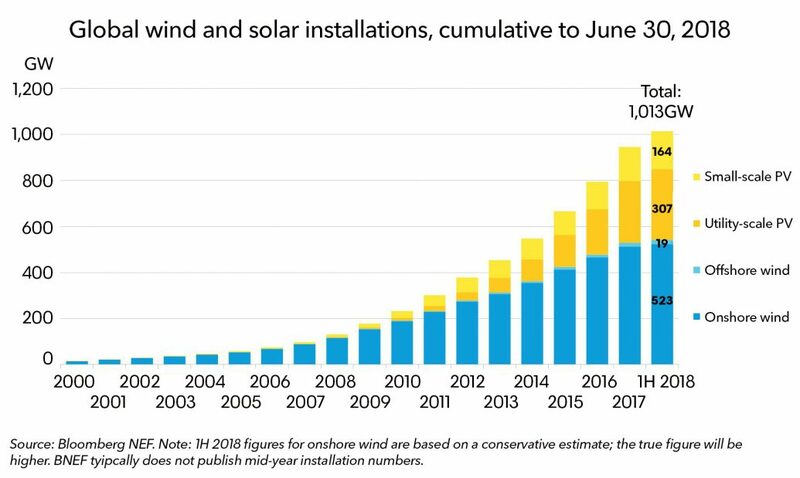 The importance of this latest figure is underlined when examining the astonishing pace of growth of the combined wind and solar industries, with total installed capacity growing 65-fold since 2000. This is largely due to the substantial investments made in recent years as the risks of climate change became clearer and institutions began to encourage moving away from a fossil-fuel centric economy. Narrow the focus to the solar PV industry and the expansion is even more impressive. In 2007 there was just 8 gigawatts (GW) of solar PV technology compared to the wind industry's 89 GW, whereas today solar PV accounts for 46% of the combined total capacity. Global wind and solar production are still up and coming parts of the global renewable energy total, which is reportedly around 20% of the total energy production worldwide. Solar and wind are by far the fastest growing sectors of the industry and it is estimated capacity will reach 2 TW by 2023, half the time of the first. Due to technological innovation and subsequent declines in cost, the level of investment necessary to reach this next benchmark will also be greatly reduced. Get solar panels on your workplace or children's school with Planet Ark Power. Hang your washing outside - free solar power.